Ed Walters is the CEO and co-founder of Fastcase, an online legal research software company based in Washington, D.C. Under Ed’s leadership, Fastcase has grown into one of the world’s largest legal publishers, currently serving more than 800,000 subscribers from around the world. Before founding Fastcase, Ed worked at Covington & Burling in Washington D.C. and Brussels, where he advised clients such as Microsoft, Merck, SmithKline, the National Football League, and the National Hockey League. His practice focused on corporate advisory work for software companies and sports leagues, and intellectual property litigation. Ed worked in the White House from 1991-1993, first in the Office of Media Affairs and then in the Office of Presidential Speechwriting. Ed graduated from Georgetown University and the University of Chicago Law School, where he was an editor of The University of Chicago Law Review, and he clerked for the Hon. Emilio M. Garza on the U.S. Court of Appeals for the Fifth Circuit. He is licensed to practice before the U.S. Supreme Court and the U.S. Courts of Appeal for the Fourth and Fifth Circuits. He serves on the boards of Pro Bono Net, Public.Resource.org, Friends of Telecom Without Borders, and Salsa Labs. He teaches Law of Robots, a class about the frontiers of law and technology, at Georgetown University Law Center. Ed Walters talks about his book, “Data-Driven Law: Data Analytics and the New Legal Services" which discusses data informs and the aspects of modern life. 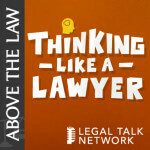 Ed Walters and Michael Sander talk about how data analytics make legal services less risky for clients and give a strategic advantage to lawyers in litigation. Ed Walters talks about AI Sandbox, Fastcase’s new artificial intelligence initiative that aims to encourage firms’ experimentation with AI. Host Jared Correia and Ed Walters have a genuinely interesting conversation about paper. Trent Carlyle, Ed Walters, Andrew Gay, and Austin Lindsey talk about what their companies are providing to those affected by hurricane Irma. This year at ABA TECHSHOW, Molly McDonough catches up with Legal Rebels Ed Walters and Kevin O’Keefe. This podcast focuses on ImmigrationJustice.us, a website built to organize legal professionals who are seeking ways to help immigrants. Andrew Arruda, Shamla Naidoo, and Ed Walters talks about artificial intelligence and how technology is helping lawyers, not replacing them. For Fastcase founders, the message is: Change, and do it faster! Legal technology has changed since 1999, when Ed Walters and Phil Rosenthal founded the legal research service Fastcase—but not as much as they’d like. Victor Li chats with Fastcase CEO Ed Walters about the “robot revolution” and how the law might have to change to handle machines.